This is a recipe we are extremely excited about because we discovered an easy DIY pizza recipe to replace Boboli and costs about $5 less as a result. If you don't want get involved with rolling out dough, we completely relate and would still recommend using Boboli's whole wheat crust. Remove dough from the refrigerator and let rest for several minutes (Note: If using a silicon rolling pin, place it in the freezer for a few minutes prior to use). Heat a skillet over medium-low flame and cook chicken sausage for about 8 minutes, rotating frequently. Remove from heat and let the meat rest. 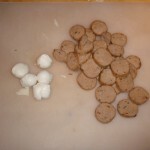 When cooled, slice sausages into 1/4 in slices or thinner if preferred. Prepare a shallow roasting pan or cookie sheet by spraying or brushing a light layer of olive oil over the surface. Another option is to put down a thin layer of cornmeal to prevent sticking. Preheat oven to 400 degrees. 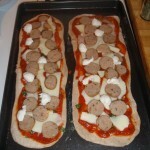 For this recipe, we cut the dough into two even portions and roll out 2 pizzas. Prepare to roll out the dough by sprinkling a pinch flour over the surface you will be rolling the dough on. Sprinkle flour on the first portion and set aside the second; slowly knead the dough and work into a rectangular shape. Place dough on the counter and use the rolling pin (sprinkled with flour) to roll out the dough into an evenly portioned rectangle. Place the dough on the baking sheet and use your fingers to keep the rectangle stretching so that it doesn't shrink back to a smaller size. Repeat process for second portion of dough. 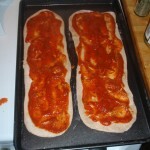 With dough now on the backing sheet, coat each rectangle with tomato sauce. 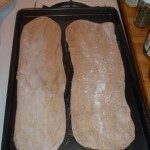 Be sure to coat the rectangle evenly and leave a 1/4 inch border of plain dough around the sides. Now add minced garlic and basil, sprinkling each evenly on top of the sauce. Next comes the shredded mozzarella, sprinkle evenly around the pizza in a single layer. Add sliced chicken sausage and sliced artichoke crowns in even rows and add as much or as little as you desire. 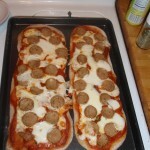 ; each rectangular dough should hold the equivalent of roughly one sausage link. Finally, cut the mini mozzarella balls in half and add them to the pizza, roughly 8 halves to each rectangle. Place baking sheet on the middle rack of the oven and bake for about 10-12 minutes or until crust is golden brown. Remove from oven and let cool; handle with care when transferring to a cutting board to slice as the cheese may slide easily when fresh from the oven.